That's it. I'm getting a new camera! The pictures I took of Rachael Ray's Chicken Tortilla Pie just don't do it justice. Although, in my own defense, the picture from the magazine ain't that great either. So there. You can find this recipe in the October issue of Every Day with Rachael Ray. You definitely have to like tomatillos in order to enjoy this recipe (you probably like tomatillos if you like green salsa). And if you have never tried them, now's your chance! Aside from all the cheese, this is a healthy meal, with lean ground chicken and tons of veggies. Plus, the flavor is spicy but not hot. And, it came in under the ever-important 30 minute mark. 1. In a medium nonstick skillet, heat 1 tablespoon EVOO, 1 turn of the pan, over medium-high heat. Add the ground chicken and cook, stirring, until browned, 2 to 3 minutes. Add the zucchini and bell pepper, then the cumin, coriander and pepper; season with salt. Cook over medium heat for 10 to 12 minutes. Stir in the lime juice. 2. In a medium saucepan, heat 1 tablespoon EVOO, 1 turn of the pan, over medium-high heat. Add the garlic, onion and jalapeños and cook for 5 minutes. Stir in the beer and boil to reduce by half, about 3 minutes. Add the tomatillos and simmer for 6 to 7 minutes. 3. Heat a large skillet over high heat and blister the tortillas, about 30 seconds on each side. 4. Preheat the broiler to high. Brush the inside of an 8-inch round cake pan with the remaining 1 tablespoon EVOO, 1 turn of the pan. 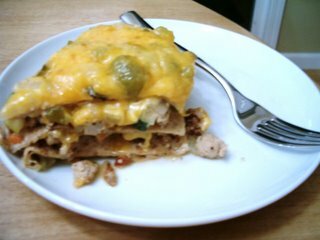 Place a tortilla in the pan, then top with one-third of the chicken, one-quarter of the tomatillo sauce and 1/2 cup cheese. Repeat the layering 2 more times. Top with the remaining tortilla, tomatillo sauce and cheese. Broil for 2 minutes until the cheese is melted. I wanted to try this recipe so I'm happy to hear it turned out well. I am always proud of myself when I try the healthier ones! I think I'll do what you did, but I don't know if I will be able to find tomatillos here. Still, this looks absolutely delicious! Thanks for sharing! I hope you can find all the ingredients! It's worth it to use the tomatillos.